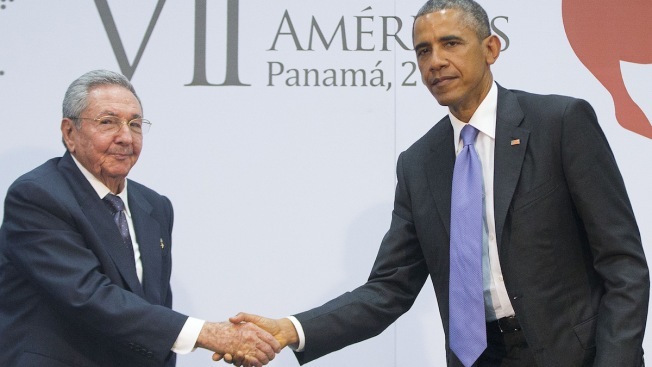 US President Barack Obama and Cuban President Raul Castro shake hands during their meeting at the Summit of the Americas in Panama City, Panama, Saturday, April 11, 2015. The two leaders will hold a formal meeting Tuesday in New York City. President Barack Obama will hold a formal meeting Tuesday with Cuban President Raul Castro. The meeting comes on the sidelines of the annual United Nations General Assembly, a massive gathering of world leaders in New York. It marks the second face-to-face meeting between Obama and Castro since the U.S. and Cuba restored diplomatic relations late last year. Obama and Castro also convened a rare phone call earlier this month ahead of Pope Francis' visit to both their countries. In addition to his bilateral meeting with Castro, the White House says Obama will meet with the president of Kazakhstan on Tuesday.